I got my self speaking to a bot in Twitter! XP. Even this post is not about SL or grids, I found funny to add in here because, it is about bots (which I spoke about it like two months ago on this blog). This happens when I began to be new in twitter. I was looking to follow some people (specially those persons who likes Second Life and other grids like Osgrid) and I added one of this twitter users, but actually he or she is a bot! 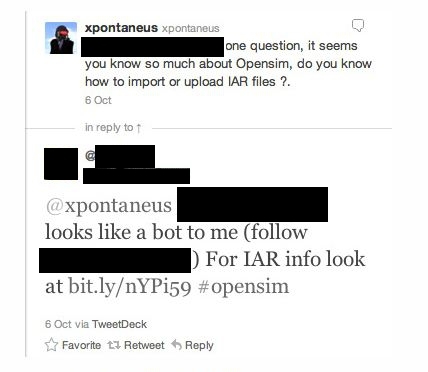 (I was asking about how to upload IAR files in Opensim). I would like to thanks to the person who told me I was speaking to a bot, because may be I would never new about it. Anyway I take this just as a fun and not like to be cheated by one of this programs but for other people be aware may be next time you would be speaking to a bot and not to a human!. This entry was posted in Old Post on November 27, 2011 by Xpontaneus.